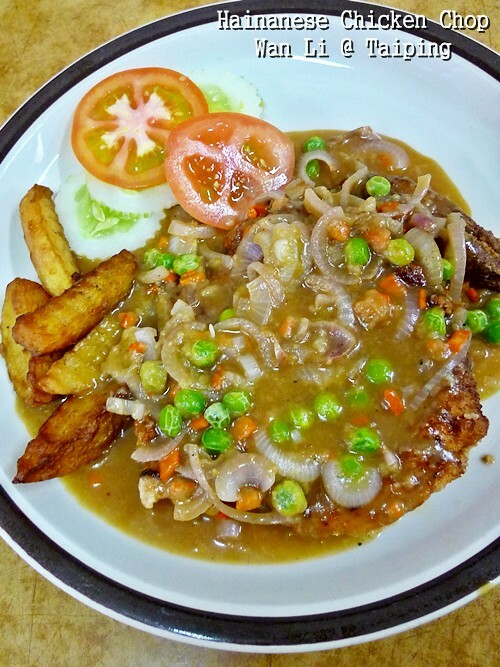 Hainanese Chicken Chop (RM6.50/USD2.00) – Gravy-licious serving of a tender chicken chop battered, fried and topped lavishly with the brown sauce with onions, carrots and peas. 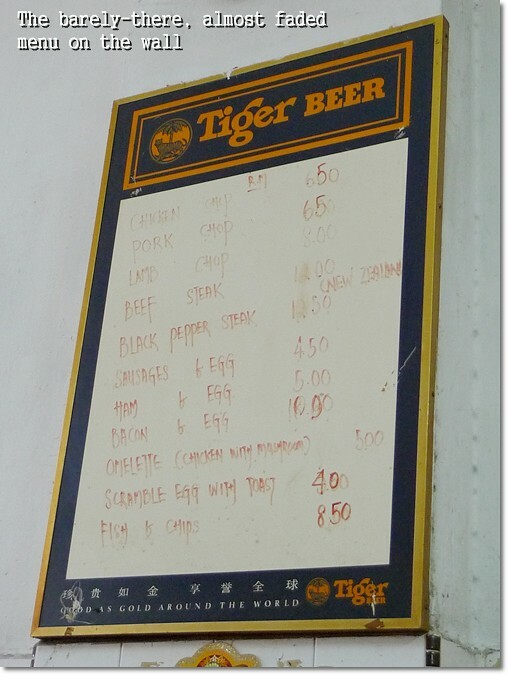 I wrote about Yut Sun Restaurant in Taiping before, a famous kopitiam that serves a wide array of Hainanese dishes, including the perennial favourite of many; Hainanese Chicken Chop, as well as the not-so-common Roti Sayur, and they even have an ‘Egg Steak‘ to pique your interest. Best of all, Yut Sun’s PORK-FREE, hence you’ll see people from all races dining together in harmony ….. 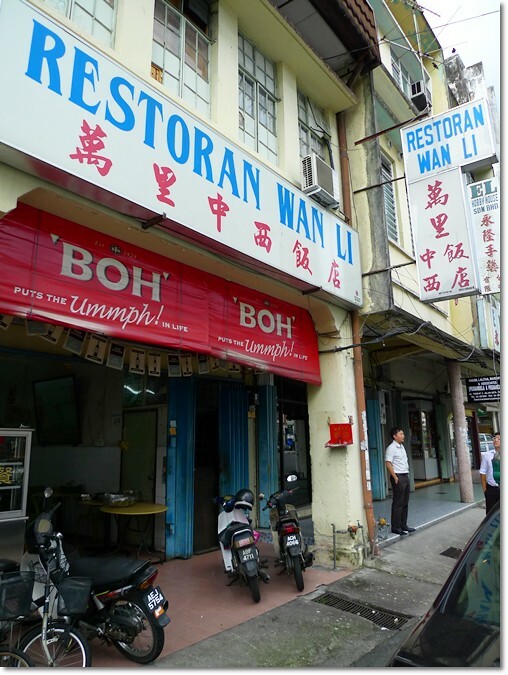 However, this time around, I was aiming for Wan Li Restaurant on Jalan Kota instead. Situated on the same side as Kok Beng Hainan Chicken Rice (amongst the TOP 10 Chicken Rice in Malaysia!!) and opposite of Kum Loong Dim Sum, most people would pass by this place without even batting an eyelid; judging from the disdain and rather rundown outlook of the premise. But DON’T come to conclusion just yet. For more often that not, it’s places like this that holds promise, and dishes out foods that arrest your attention; ensuring perpetual revisits ……. One fine afternoon in Taiping, with our guts barely done with digesting the ‘roti canai‘ we had for breakfast at Bismillah Restaurant (that’s coming up in another post, promised! ), it was already time to hunt for lunch. Good thing was, Taiping’s bursting with eateries;both old and new. On one hand you have the classics like Yut Sun, Restoran Air Kacang Taiping, and everything else at the Larut Matang Food Court. But after repeated visits, you’d long for cafes and fast food, hence you can proceed to Taiping Sentral for your fix at McDonald’s, A&W, Noodle Station, and such. Barely visible was Wan Li’s menu on the wall; but our eyes gleamed with anticipation (and surprise, no less) when we saw Chicken Chop, Pork Chop and Beef Steak on the board. Stepping into the unassuming coffee shop, filled with a predominant lunch crowd gobbling on their economy rice fare (mixed rice, or ‘chap fan‘), I was not sure whether this Wan Li was the same Wan Li I read about in a food guide; purportedly serving authentic Hainanese dishes. But a reassuring confirmation came from the lady boss herself (this I presumed, since she was the one running the place), and we were seated in a jiffy. It was barely 1pm, and business has yet to pick up. Glancing around the premise, I was pleasantly awed by the sheer cleanliness of the restaurant and thus clearing my doubts on the possibly-compromised hygiene aspect. Chicken Chop and Pork Chop for merely RM6.50 each? I stared at the whiteboard again, to brush off potential bloopers when settling the bill. Nope, my eyes did not deceive me. The most ‘expensive’ item on the menu was a black pepper steak (from New Zealand!) for RM12.50/USD3.80. And everything else was priced below RM10. Talk about affordability. 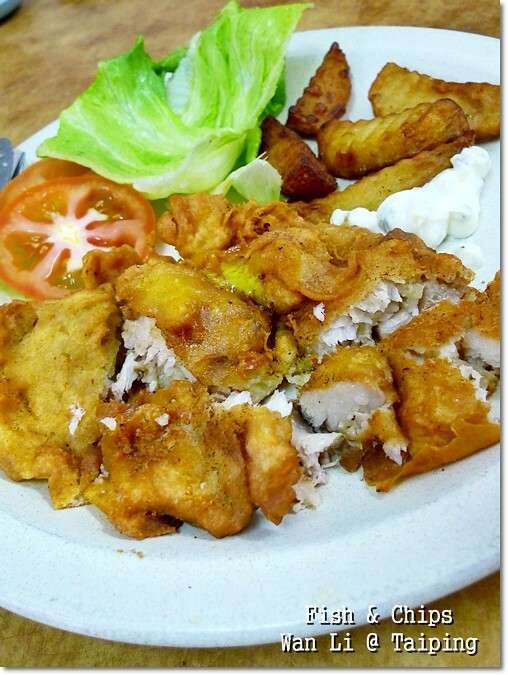 Fish & Chips – REAL fillet of fish coated with batter and fried to crunchy perfection. For RM8.50/USD2.60 per serving, it’s a steal really. After placing our orders, it took them a good 10-15 minutes to serve our beverages. Yeah … unlike the other coffee shops nowadays that prepared their coffee and tea prior to the day’s business, at Wan Li, they make your drink by hand, and per order. Scroll down for a look at the ultra-frothy drinks. Then the mains arrived. The Chicken Chop was exactly how I imagine a true-blue, authentic Hainanese Chicken Chop to be. Crispy batter-coated tender fillet of chicken drenched in the most lip-smacking brown sauce with abundance of peas, carrots and onions. Then a few chunks (refuse to call them pieces) of crinkle-cut potatoes, and the garnishing of sliced cucumber and tomatoes. The Fish & Chips on the other hand, was satisfactory as well, a fact that belies its initial appearance. Served with a rather dainty dollop of mayo on the side, and the thick fries again, the deep-fried fillet of fish (it’s ‘kurau’ or snapper, if I’m not mistaken) looked to be devoid of any moisture when placed in front of me. After the first bite, i was sold. The batter was buttery, and unlike the generic tasteless variety commonly used to coat the dory fish (or worse, frozen fish fingers!) at some places. And I thought I was being my usual self, going undercover and unnoticed. Whoops. 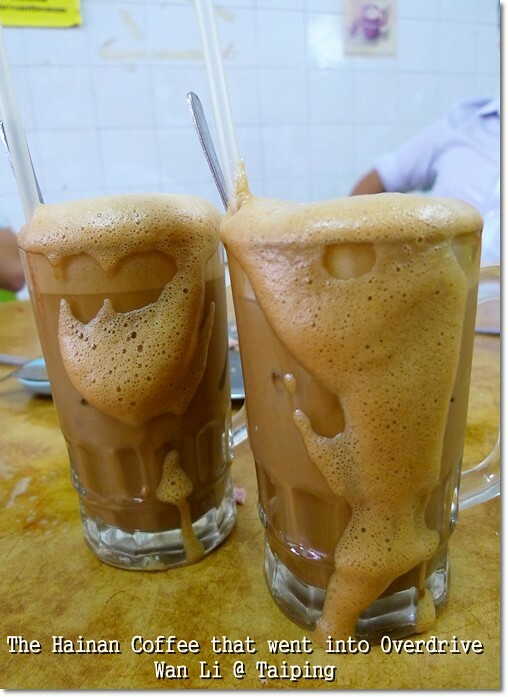 The glasses of iced MOCHA coffee (RM2/USD0.60 each) overflowing from the froth produced. Their milk tea was satisfying as well (not in picture). Oh, and we sampled two rolls of the fresh-from-the-kitchen Choon Piah, or Hainan Spring Rolls, or Lor Bak (whatever you might call it). Nothing earth-shattering, but the skin of the rolls was bursting at the seams, filled generously with the ingredients stuffed into it. As homemade as spring rolls could be. Wan Li Restaurant @ Jalan Kota – Blink and you might miss this restaurant, overshadowed by the many spanking new eateries in Taiping town. Lunch was good. At least, this could be a place to fall back on, in case we’ve run out of place to eat in the future. Wan Li Restaurant has been operating at the exact same spot since 1997, as I was told by the lady herself. Though they do not practise open-kitchen concept (truthfully how many coffee shops do? ), you can actually see them in action if you use their washrooms. Yes, the kitchen was rather open, but thankfully … nothing unsavoury to the sight. Business hours : 8am-3.30pm, 6-10pm. And as usual, a GOOGLE MAP to Wan Li Restaurant. Of course it’s on a whole different spectrum here. For merely RM2 per glass, you can’t expect the BEST possible coffee beans, right? But in its defense, the coffee was rather good, according to my colleagues who had them. 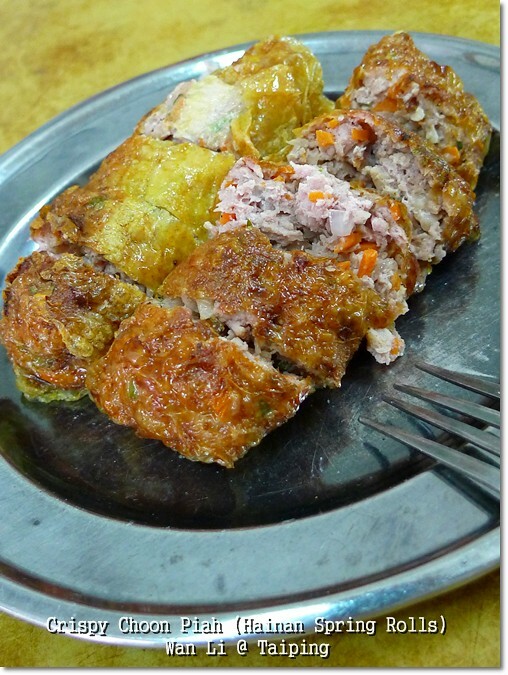 You can get them at some Chinese eateries, though I doubt many make them the way they’re supposed to anymore; with crab meat/prawn meat in the fillings. Aiyo…Must ask my uncle to tarbao some spring rolls back together with Char Kuey Teow from the market when he makes the annual Cheng Beng trip up to Taiping! CKT from the market? You mean the one with fishballs ah? Erm … not exactly my fav though. But the spring rolls? Oh yeah !!! From Kampar to Taiping …… erm, about 1.5 hours, at most? Come on … do a side crawl while on the way to Penang! Comparing the prices with even peers in the same town, or neighbouring towns, Wan Li’s prices are indeed cheaper. Erm, sometimes places like this never cease to amaze in terms of quality food at reasonable prices. Haha … that’s probably one of the reason why I’m putting off that thought, I guess. Rather troublesome to bring along a DSLR to work on a daily basis. Will go for lunch next Saturday. When’s their off day? The lady said they do not fix their off day, hence it’s better to call before going. The number’s at the end of the post. Definitely worth a trip! I mean, I dun see them chun piah like that anymore wei! And I been craving fr good true blue (u said it!) hainanese chic chop for nearly a year! i am a taiping lang and i have not step into this restaurant. will do it the next time i am back. When i look at the frontage of the shop,,,,western food should’t eat in this type of enviroment,,,,,,low class..
Dan, so Western food should only be eaten in posh dining environment? Totally agree with J2Kfm and it is sad to find out that the shop already closed down. It has been operating for more than 20 years, from first by renting a stall at Taiping Ais Kacang coffee shop till having their own shop, Wan Li Restaurant. I was a fan of this hainanese chicken chop since I was a kid. Hopefully they just move to somewhere else in Taiping and still running their business. the uncle introduced new drink to me: horlicks plus milo, taste good… is my fav eatery shop now. Thanks wing. Horlicks plus Milo?! Wah …like two childhood favourites rolled into one! Hope 2 drop by this place when Im in Taiping.